COMMENTARY: The writer leaves it to 1 Maccabees to fill in all the gory details about the battles that made this possible. 2) they destroyed the altars erected by the foreigners in the marketplace and the sacred shrines. COMMENTARY: This confirms the existence of Greek and Canaanite altars and shrines in places besides the temple. 3) After purifying the temple, they made another altar. Then, with fire struck from flint, they offered sacrifice for the first time in two years, burned incense, and lighted lamps. They also set out the showbread. COMMENTARY: 1 Maccabees says three years. It’s an easy discrepancy to happen, as some would count a partial year and some would not. As for the fire struck from flint, my first thought was, “Why mention that it came from flint?” But looking into it, I learned something about my own liturgy that I’d never noticed before. In many Catholic churches the priest does indeed ignite the Easter candle with a device that strikes flint with steel. Although I have not found a symbolic explanation, I can imagine one. One could see the flint as Earth coming in contact with the Divine to kindle a spark of new light and warmth. One should also consider that back in the days when people couldn’t just easily produce fire at the flick of a match or a lighter, they preferred, as often as possible, to light fires from other fires. But if your entire city has fallen into corruption, you don’t just light the temple flame from the nearest hearth or lamp, you need a new, unsullied spark to reflect a new and better era. 4) When they had done this, they prostrated themselves and begged the Lord that they might never again fall into such misfortunes, and that if they should sin at any time, he might chastise them with moderation and not hand them over to blasphemous and barbarous Gentiles. COMMENTARY: “Barbarous”, like “politically correct”, is one of those terms that people only apply to others not of their own company. This whole mess came from Greeks regarding Jews as barbarians, and some self-loathing Jews agreeing with them. Jewish independence was short-lived, of course, despite this prayer. They soon fell into the hands of their allies, the Romans. This meant that Jesus would not only be born into occupied territory, but one convinced that their fall must be another round of punishment, driving them to still more fevered efforts to exaggerate every letter of the law, to the detriment of its spirit. (Except for those irregularities introduced by the Maccabees, of course.) However they might have wanted to believe otherwise, the extremes of the Pharisees, Zealots, Essenes and other such groups did not reflect typical Judaism, but a sore and swollen distortion. Take the woman caught in adultery, brought to Jesus to see if he would demand that she be stoned. The Written Law described maximum penalties, not typical ones. Adultresses were rarely ever stoned to death in Jewish history. Bathsheba, the mother of King Solomon, certainly wasn’t, and neither was Gomer, the unfaithful wife of the prophet Hosea. The Sanhedrin, by tradition, used to listen to all extenuating circumstances that might mitigate the penalty, with the worst possibility present mainly as a sobering thought about what could have happened, to make the accused appreciate the more merciful sentence received. But years of believing themselves accursed for inadequate devotion had made Judea fanatical. And so they expected an outspoken street-preacher like Jesus to be even more fanatical still, demanding the woman’s death, despite the law saying that only Romans could sentence anyone to execution. The Bible says that those who brought the woman to Jesus intended to test him; this could have become the signal for a new uprising, similar to Mattathias killing the apostate. Jesus had a different plan. 5) On the anniversary of the day on which the temple had been profaned by the foreigners, that is, the twenty-fifth of the same month Kislev, the purification of the temple took place. COMMENTARY: In this way they purged the tragedy even from the date and transformed it into a time of joy. In a symbolic sense, they reclaimed time as well as the temple, and blotted out the disgrace. 6) The Jews celebrated joyfully for eight days as on the feast of Booths, remembering how, a little while before, they had spent the feast of Booths living like wild animals in the mountains and in caves. COMMENTARY: So, in a sense, Hanukkah began as catching up on a lost holiday period. Ironically, the Feast of Booths is supposed to symbolize living like their ancestors, camping out under the stars. 7) Carrying rods entwined with leaves, beautiful branches and palms, they sang hymns of grateful praise to him who had successfully brought about the purification of his own place. COMMENTARY: Parading with rods entwined with leaves traditionally belonged to the worship of Dionysius rather than the God of Israel. But since they had been forced at sword-point to do this for Dionysius, they wanted to show the same worship to the God that they really believed in. This matters in the evolution of Catholic thought. Martin Luther felt appalled at how many Pagan customs had crept into Catholic worship, but he also rejected the books of Maccabees, which set the precedent of adapting Pagan symbols of worship to Abramic religion. He cited other scriptures about rejecting Pagan customs of worship, but one could also interpret these as specifying which customs were forbidden, such as having temple prostitutes or boiling a calf in his mother’s milk. Certainly Jewish and Pagan worship had a number of points in common, such as singing hymns, burning incense and making animal sacrifices. In any case, Jesus seemed to have taken the Maccabean precedent to heart. At a time when grain cults and wine cults abounded in Pagan society, He said of bread, “This is my body” and of wine, “This is my blood”, thereby making an easy bridge for Pagan converts. 8) By public decree and vote they prescribed that the whole Jewish nation should celebrate these days every year. COMMENTARY: And thus we have Hanukkah. 9) Such was the end of Antiochus surnamed Epiphanes. COMMENTARY: This writer seems less invested in aggrandizing the Maccabee brothers, ascribing the restoration of the Temple to God striking down Antiochus, while skimming over the military campaigns along the way. 10) Now we shall relate what happened under Antiochus Eupator, the son of that godless man, and shall give a summary of the chief evils caused by the wars. COMMENTARY: There’s a play on words, here. Eupator means “He had a good father”, so calling this second Antiochus “the son of that godless man” means calling his very name a lie. Interesting choice of epithet, though. One could have called him vicious, arrogant, foolish, blasphemous, stinky, all manner of insults, all equally true. But he wasn’t just blasphemous, he was godless—because if he had truly believed in the Greek pantheon with which he’d tried to supplant the God of Israel, he wouldn’t have tried to raid the Temple of Diana. So the writer underlines Antiochus’s hypocrisy. 11) When Eupator succeeded to the kingdom, he put a certain Lysias in charge of the government as commander-in-chief of Coelesyria and Phoenicia. COMMENTARY: Replacing Ptolemy Macron, who had preceded him in that office. 12) Ptolemy, called Macron, had taken the lead in treating the Jews fairly because of the previous injustice that had been done them, and he endeavored to have peaceful relations with them. COMMENTARY: This is a common strategy among oppressors, to replace anyone in authority who grows too fond of the oppressed. I saw this in Tucson when I lived there; police assigned to Old Pascua (a Yaqui village that had become engulfed by Tucson’s expansion and turned into a neighborhood) would get switched out with someone new if news got out that they had started to like and understand the Yaquis too well. At least that was the popular perception, and it appeared accurate to me. 13) As a result, he was accused before Eupator by the King’s Friends. In fact, on all sides he heard himself called a traitor for having abandoned Cyprus, which Philometor had entrusted to him, and for having gone over to Antiochus Epiphanes. Since he could not command the respect due to his high office, he ended his life by taking poison. COMMENTARY: He had supported Antiochus IV in the invasion of Cypress. But such are the vagaries of royalty, that you can fall into disfavor with the son for having stood by the father. 14) When Gorgias became governor of the region, he employed foreign troops and used every opportunity to attack the Jews. 15) At the same time the Idumeans, who held some strategic strongholds, were harassing the Jews; they welcomed fugitives from Jerusalem and endeavored to continue the war. COMMENTARY: Struggles don’t end with winning independence. People on all sides will next try to see what they can make of the upheaval of regime-change. 16) Maccabeus and his companions, after public prayers asking God to be their ally, moved quickly against the strongholds of the Idumeans. COMMENTARY: So now we’re going to get some battle-accounts after all. Why go into it now, when refraining earlier? Perhaps because now we’re dealing with maintenance against aggressors, rather than overthrowing a government? 17) Attacking vigorously, they gained control of the places, drove back all who were fighting on the walls, and cut down those who opposed them, killing no fewer than twenty thousand. COMMENTARY: This writer does not concern himself much with strategy. “Attacking vigorously,” much as we would like to think otherwise, does not automatically win the day. 18) When at least nine thousand took refuge in two very strong towers, well equipped to sustain a siege, 19) Maccabeus left Simon and Joseph, along with Zacchaeus and his forces, in sufficient numbers to besiege them, while he himself went off to places where he was more urgently needed. COMMENTARY: But we don’t hear anything more, here, about this more urgent need. Who he leaves behind matters more. 20) But some of those in Simon’s force who were lovers of money let themselves be bribed by some of those in the towers; on receiving seventy thousand drachmas, they allowed a number of them to escape. COMMENTARY: Now here’s something omitted from 1 Maccabees. Notice that the writer takes care not to implicate Simon himself. 21) When Maccabeus was told what had happened, he assembled the rulers of the people and accused those men of having sold their kindred for money by setting their enemies free to fight against them. COMMENTARY: Rather than administrating rough field justice, he took the time to hold a trial. And that’s why we hear about this battle and not others. The Egyptian Jews must have heard scary things about the Maccabean revolt, particularly when it came to Hellenized Jews like themselves. The writer gives them reassurance that they can trust the rest of the Jewish community to not kill them out of hand. 22) So he put them to death as traitors, and without delay captured the two towers. 23) As he was successful at arms in all his undertakings, he destroyed more than twenty thousand in the two strongholds. COMMENTARY: Again, this book doesn’t dwell on the military details. 24) Timothy, who had previously been defeated by the Jews, gathered a tremendous force of foreign troops and collected a large number of cavalry from Asia; then he appeared in Judea, ready to conquer it by force. 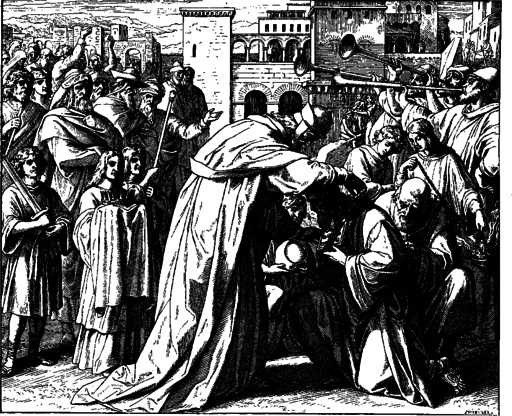 COMMENTARY: 2 Maccabees 8:30-33 recounts this previous defeat. 25) At his approach, Maccabeus and his companions made supplication to God, sprinkling earth upon their heads and girding their loins in sackcloth. COMMENTARY: Sackcloth is burlap. Uncomfortable enough as clothing in general, it would make particularly irritating jock straps. This went beyond the usual donning of sackcloth and ashes. The anomalous practice could have more significance than penance, however. Catholics call this “mortifying the flesh”, the purpose being to make the body so uncomfortable that it drives the spirit out into a transcendent experience beyond the discomfort. Catholics have largely departed from such customs, though shamans (real ones) still practice mortification, not out of any hatred for their flesh, but to get a different, nonmaterial perspective. 26) Lying prostrate at the foot of the altar, they begged him to be gracious to them, and to be an enemy to their enemies, and a foe to their foes, as the law declares. COMMENTARY: Now that they’ve reconsecrated the temple, they claim the right to receive the rewards of upholders of the law. 27) After the prayer, they took up their weapons and advanced a considerable distance from the city, halting when they were close to the enemy. COMMENTARY: Better, if possible, to hold their battle in the country than the city. Sieges make both sides miserable for way too long. 28) As soon as dawn broke, the armies joined battle, the one having as pledge of success and victory not only their valor but also their reliance on the Lord, and the other taking fury as their leader in the fight. COMMENTARY: 1 Maccabees covers this dawn battle in 5:30-34. 29) In the midst of the fierce battle, there appeared to the enemy five majestic men from the heavens riding on golden-bridled horses, leading the Jews. 30) They surrounded Maccabeus, and shielding him with their own armor, kept him from being wounded. They shot arrows and hurled thunderbolts at the enemy, who were bewildered and blinded, routed in utter confusion. 31) Twenty thousand five hundred of their foot soldiers and six hundred cavalry were slain. COMMENTARY: 1 Maccabees does not cover this, but instead attributes the rout of the enemy to fear of Judas Maccabee. From the material point of view, this seems like an obvious later fabrication. I will say, though, that in modern battles soldiers have seen apparitions and other strange sights not featured in the official reports. It all depends on who you talk to. Something similar has happened to me, too, but not on a battlefield. I lived, at the time, in the Bay Area. I took a shortcut to church, passing through the Berkeley Campus. The path I followed went into a dark, forested area, crossing a bridge completely canopied by trees and hidden from the rest of the college. On that bridge a disheveled, scowling man stood, who started raving at me, saying horrible, obscene, violent things. He told me in lurid detail what he would do to me “if it weren’t for all those filthy, rotten angels all around you!” I got past him unharmed and made it safe to Mass. 32) Timothy, however, fled to a well-fortified stronghold called Gazara, where Chaereas was in command. COMMENTARY: 1 Maccabees 13:43-48 has an account of this. 33) For four days Maccabeus and his forces eagerly besieged the fortress. 34) Those inside, relying on the strength of the place, kept repeating outrageous blasphemies and uttering abominable words. COMMENTARY: The soldiers, maybe. In 1 Maccabees the people, especially the women and children, pleaded for—and obtained—mercy. 35) When the fifth day dawned, twenty young men in the army of Maccabeus, angered over such blasphemies, bravely stormed the wall and with savage fury cut down everyone they encountered. 36) Similarly, others climbed up and swung around on the defenders; they put the towers to the torch, spread the fire and burned the blasphemers alive. Still others broke down the gates and let in the rest of the troops, who took possession of the city. COMMENTARY: The two different accounts, when put together, show the mingled nature of humankind. The Maccabee force could be ruthless or merciful, and their enemies could be hostile or humble. If you believe that people are horrible, you can spend your whole life looking for examples and never run out. If you believe that people are wonderful, you can spend your whole life looking for examples and never run out. It all depends on how you want to spend your life. 37) Timothy had hidden in a cistern, but they killed him, along with his brother Chaereas, and Apollophanes. COMMENTARY: However, later they do battle with a Timothy in chapter 12. Could be a different Timothy, or more likely the writer’s not telling the story consecutively, since 1 Maccabees puts this confrontation later. In any case, it’s disgraceful for a military leader to be found hiding in a cistern instead of leading his troops. 38) On completing these exploits, they blessed, with hymns of grateful praise, the Lord who shows great kindness to Israel and grants them victory. COMMENTARY: I’ve always felt that God is more inclined to bless us when we appreciate the blessings we’d had before, creating a positive feedback loop. I mean, don’t you enjoy benefiting those made happy and grateful by your benefits before? Some think it wrong to attribute emotions to God, but everything indicates that He has them, and why shouldn’t he? He’s not a machine. All creatures who have thoughts also have feelings, and it seems reasonable to assume that they got their pattern from their maker. And emotions aren’t always a weakness, something to overcome. There’s nothing wrong with God taking especial delight in blessing those who delight in Him.